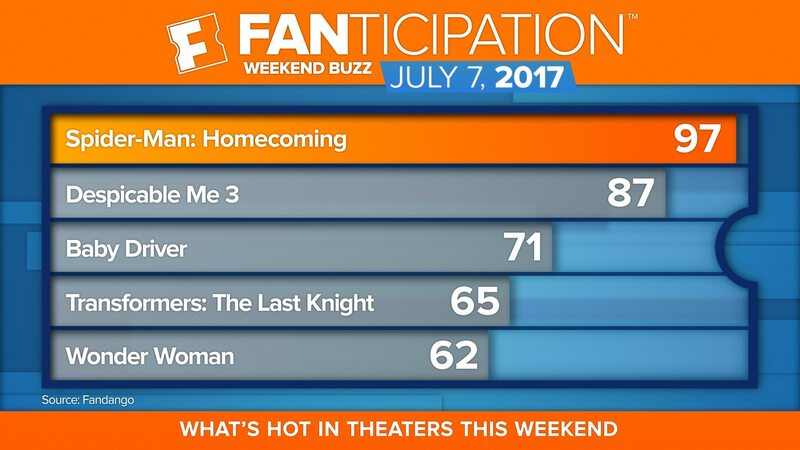 Los Angeles (July 6, 2017) – Marvel Studios’ “Spider-Man: Homecoming,” starring Tom Holland as the new Peter Parker/Spider-Man, is finding a home at the top of Fandango’s weekend sales and Fanticipation movie buzz indicator with 97 out of 100 points. As of Thursday morning, “Homecoming” is outpacing “Wonder Woman” at the same point in the Fandango ticket sales cycle. 89% are more excited to see “Homecoming” because of Holland’s credibility as a high school character. 87% have seen multiple “Spider-Man” movies on the big screen. 86% are fans of Robert Downey, Jr.; 70% are fans of Michael Keaton. Tags: Fandango, Fanticipation, "Spider-Man: Homecoming"